If possible make the toppers for the cupcakes a few days before the party so they can harden slightly to hold their shape. 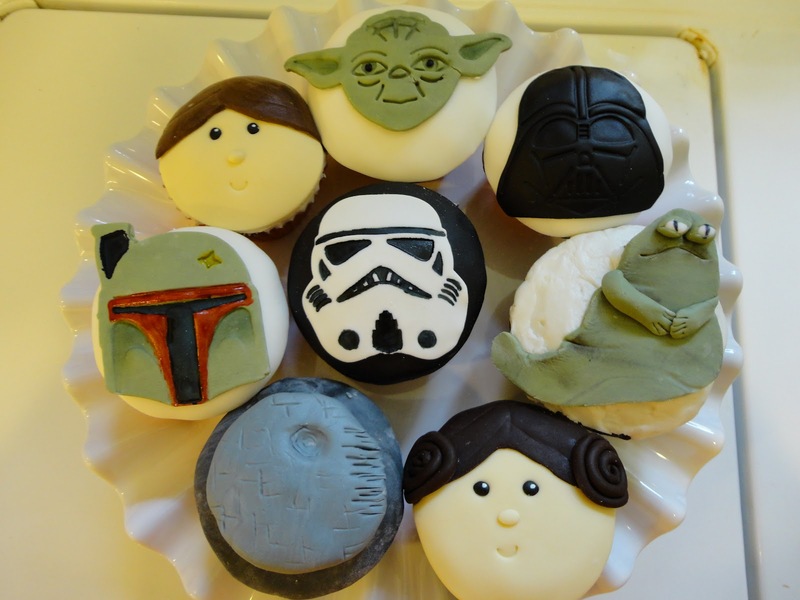 If you look at the Yoda, Boba Fett and Jaba the Hut they had a chance to harden and I think it looks nicer than the Darth Vader that curves with the cupcake. 1. Roll out your white fondant on either a lightly greased or corn starched surface. 2. 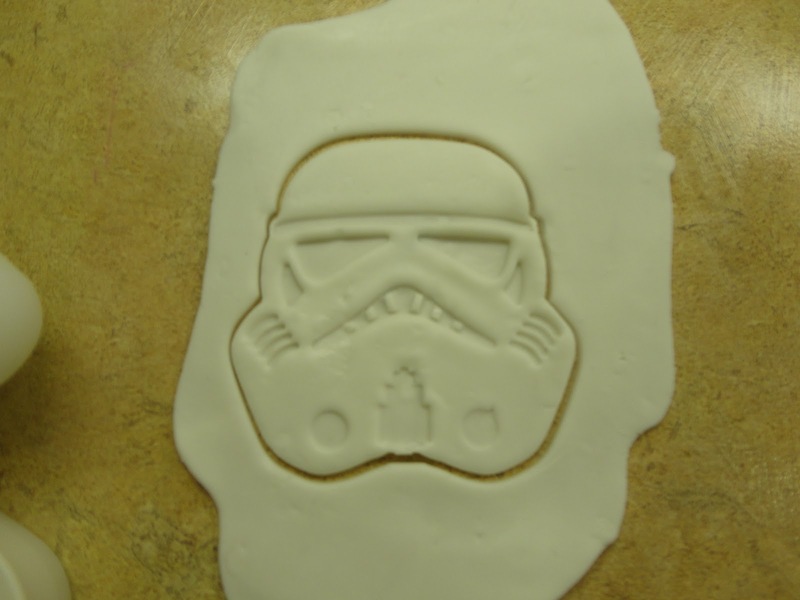 Use the cookie cutter to cut the outline of the stormtrooper. Make sure to wiggle the cutter back and forth to make a clean cut (so you don’t have to smooth around it afterward). 3. 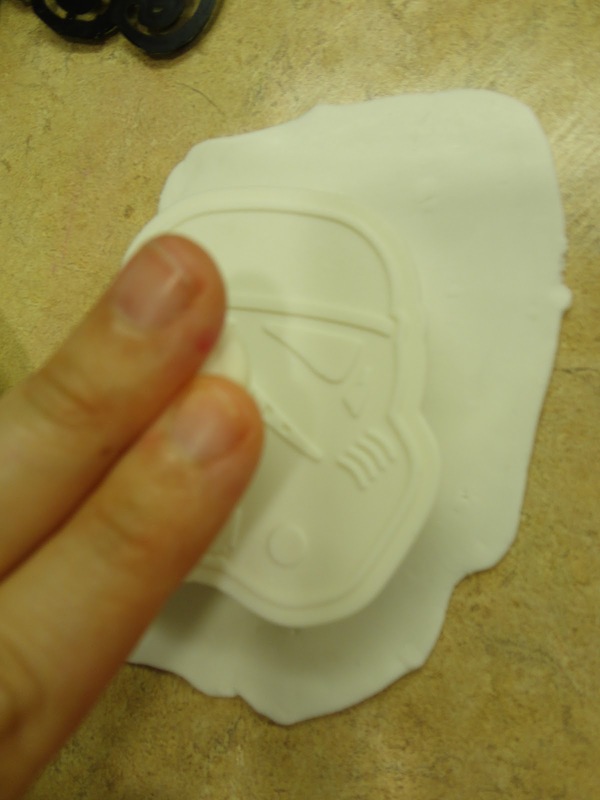 Before picking up the cutter, push the button on the cookie cutter to make the impression on the fondant. If for some reason it sticks to the cookie cutter brush a tiny bit of corn start or powdered sugar on the top of your fondant. 4. When you pull the cookie cutter away this is what it looks like. YEAH! It is that easy! Then just pull away the fondant from around it and let it sit to harden slightly. If you need to pick it up to move it then gently us a spatula or something small to get under the edge of it and lift. 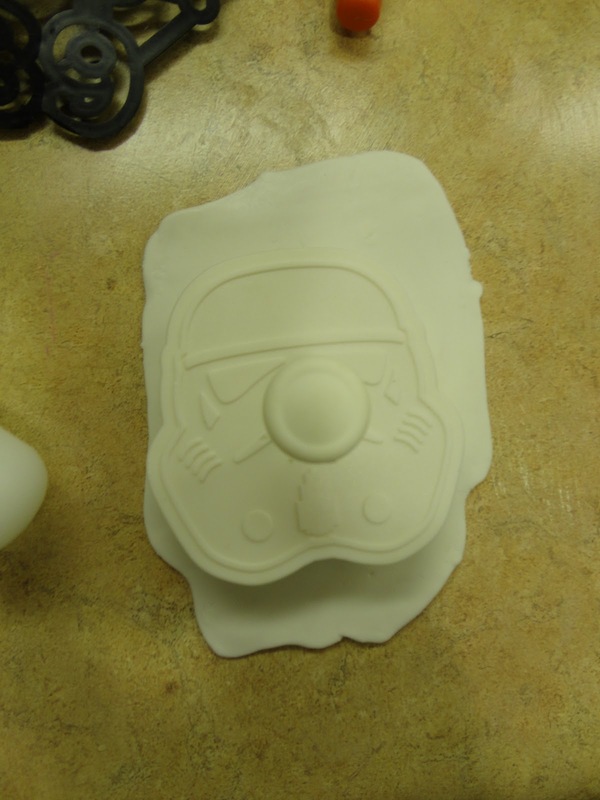 Be careful not to stretch the fondant or the stormtrooper will look funny. 6. 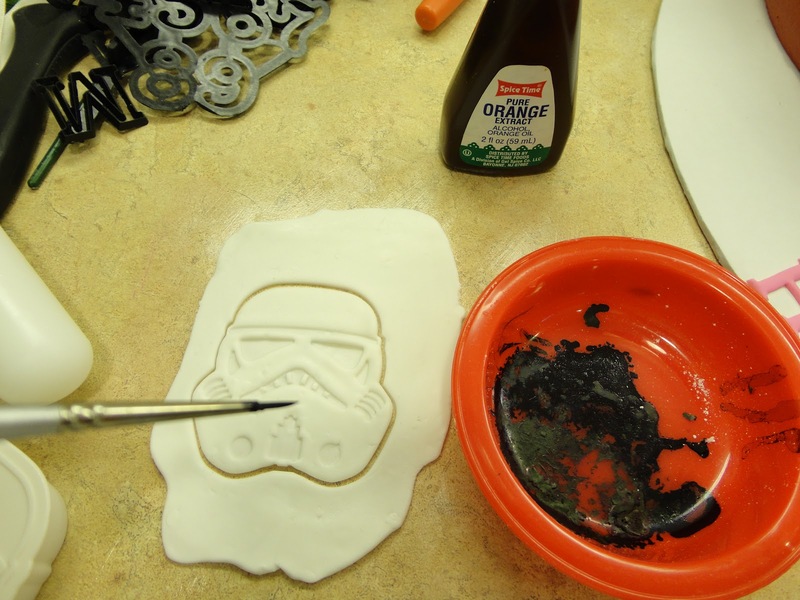 Place the storm trooper once dried on top of a spiral of frosting or on a circle of black fondant that you let dry, then place on top of your cupcake. And you are done! Hope this helps. I will do the other tutorials soon! May the force be with you until then. 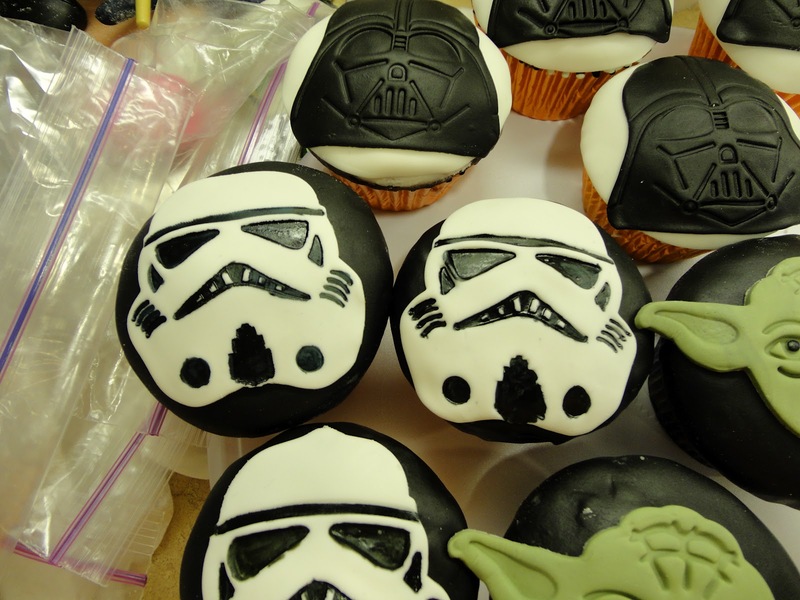 See the Stormtrooper on the top right? That is one that I tried to use a food color marker on. As you can see the lines aren’t as crisp and it doesn’t look as nice. So just stick with the tiny tiny paint brush. It works so much better.